Edwidge Danticat has 1 media appearance. The Armchair Explorers Reading Group will meet at the Around the Corner Cafe on March 17th at 6:30 pm to discuss The farming of bones by Edwidge Danticat. 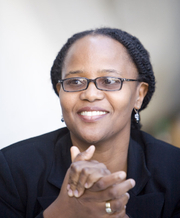 Edwidge Danticat was born in Haiti in 1969. She came to the United States when she was twelve years old and, only two years later, published her first writings in English. She holds an undergraduate degree is in French literature from Barnard College and a Master of Fine Arts degree from Brown Unversity. She currently resides in Brooklyn, New York, USA. Edwidge Danticat's short stories have appeared in 25 periodicals. She won a 1995 Pushcart Short Story Prize as well as fiction awards from several magazines. In addition to her first novel, Breath, Eyes, Memory, winning wide acclaim, her book of short stories, Krik? Krak!, was chosen as a National Book Award finalist in 1995. Edwidge Danticat's book Haiti Noir 2: The Classics was available from LibraryThing Early Reviewers. Edwidge Danticat's book Haiti After the Earthquake AUDIO EDITION was available from LibraryThing Early Reviewers. Edwidge Danticat is currently considered a "single author." If one or more works are by a distinct, homonymous authors, go ahead and split the author. Edwidge Danticat is composed of 16 names. You can examine and separate out names.